The regency of Badung covers less than one tenth of the island, but is it the most highly populated region and has an important role in modern Bali. The seat of the provincial government is in Denpasar, Bali´s capital city. Puputan sq. Denpasar´s only museum was built in 1932. This ethnographic museum (ethnography being the study of a particular society and culture) contains many prehistoric and historic instruments and textiles. One of Bali´s most visited temples, located next to the museum at Puputan sq.and near the Four faced Statue in central Denpasar. 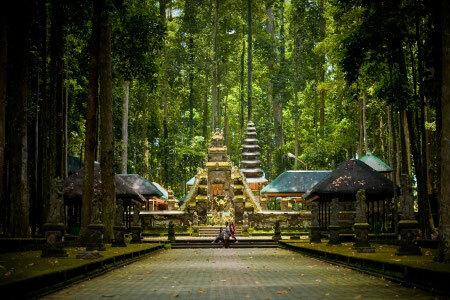 This temple is especially worth visiting for the Saraswati, Galungan and Kuningan ceremonies. Puputan sq. Bali´s center for dance and art. This art complex has a large amphi-theater that stages many of Bali´s traditional dances. It is the center of activity throughout the Bali Art´s Festival held every year, mid June - mid July. Bali´s dance, music and art institute. The STSI amphi-theater stages monthly full moon dance performances. A renovated market that provides all the locals needs. Beautifully arranged fruit, flowers for offerings, herbs, spices and all kinds of local handicrafts stretch out into two main buildings over the Denpasar River. 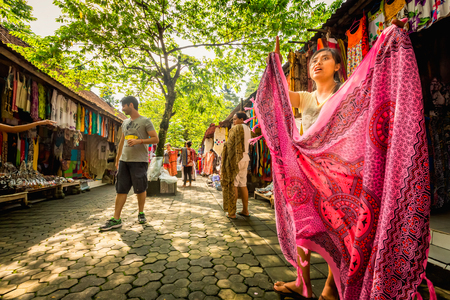 Jl.Sulawesi is the neighboring street that provides a myriad of fabrics and textiles. 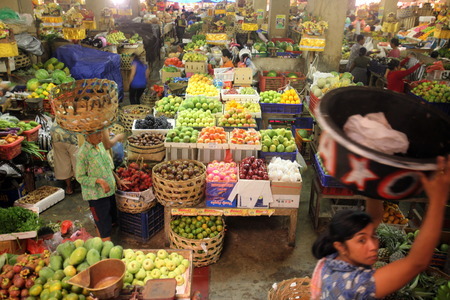 This is the second largest traditional market in Denpasar. It is renowned for its night stalls selling many varieties of Balinese food and drink. Located on Jl.Veteran, this market sells an assortment of beautiful birds and other animals including the unique Kintamani dog. Badung sq. This is the city´s central park. A statue commemorates a heroic moment in the battle of 1906. It is the location for many of Bali´s pageants and processions. Nyepi and the opening ceremony of The Bali Art Festival are held around this square. One of Bali´s oldest temples, Puri Jaganatha, and the Museum of Bali are on one side of this square. Standing in the center of Denpasar, to one side of the Puputan Square, is a large granite statue depicting Brahma as the almighty Creator of the world, nature and all its inhabitants. These palaces have seen better days but all are a good example of the traditional Balinese architecture. Perched on a high cliff on the South West tip of Bali, Uluwatu temple is one of Bali´s oldest places of worship. This temple has been built around the 11th century by Hindu high priest Empu Kuturan. It is inhabited by a group of sacred monkeys who guard the temple. This is one of Bali´s best sunset spots. Southern peninsula. Uluwatu, Geger, Goa Suluban, Padang Padang, Nyang Nyang, Bingin, Dreamland, Nusa Dua, Jimbaran, Kedonganan. Many of the above mentioned beaches are famous surfing spots. Some are difficult to access and the waves are generally for the intermediate to advanced surfer. Beware of corals and strong currents. Nusa Dua is a major tourist resort on the Southern most peninsula of the island. Set on about 450 hectares, this well groomed tourist enclave boasts 3.5 kilometers of white sand beaches, a large number of five star hotels and one of the world´s best golf courses, Bali Golf & Country Club, recently voted to be among the best 5 courses in the world. Convention halls, amphi-theaters, shopping centers and immaculate landscaping make Nusa Dua an ideal place to stay if you wish to get away from it all. Benoa Peninsula. Bordering Nusa Dua to the North this peninsula offers travelers fine hotels, water sports and similar environs as Nusa Dua. On the west coast of the Bukit Peninsula, near the airport is Jimbaran Bay. It is home to some of Bali´s top hotels, Four Season Resort, Ayana and Bali Intercontinental Resort. Guests can sail, swim and even go fishing in the bay. Jimbaran village has long been one of Bali´s traditional fishing villages and the traditional fish market offers delicious seafood right on the beach. The area, just slightly North of the airport, known as Tuban, has long enticed tourists to her reasonably priced hotels, well-groomed beaches and organized nightlife. The Waterbom Park & Spa, go-karts and hotel sports facilities fulfill daytime pleasures. Large shopping malls with many restaurants, local, international and fast food outlets stay open well into the night. Tuban is also well known for the horse drawn carts that can be seen taking visitors around the area. Kuta is world famous for sand, shopping and the nightlife. This area is jam-packed with activities, 24 hours a day. 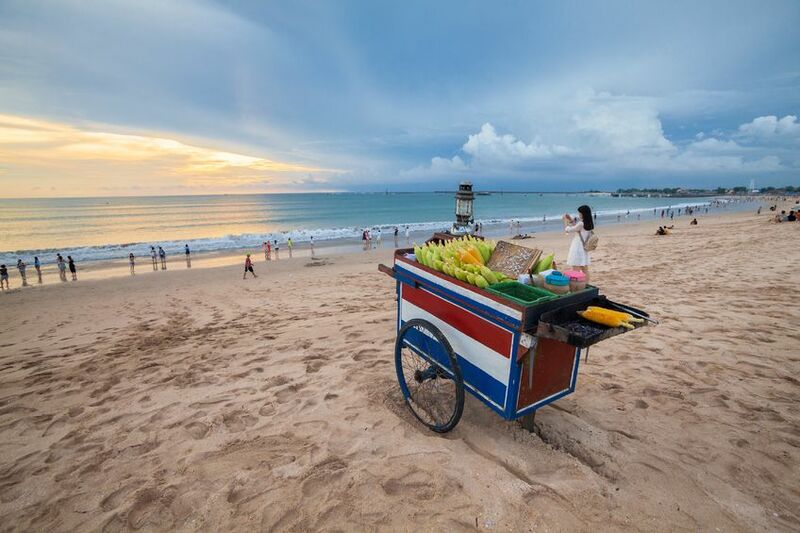 Kuta is a major hustling and bustling resort town, with hundreds of hotels, bars, restaurants and shops. Here, small guesthouses and large hotels jostle for positioning along the beachfront. Beach sellers endlessly offer their wares to the sun-worshipper; sarongs, jeweler, shells, massages and manicures, even bows and arrows. Proclaim an interest in purchasing something and these beach marketers will crowd round the unsuspecting tourist until a sale is struck. This is part of the fun of Bali. Nightlife is a major happening in Kuta with a number of surf bars, cafes and restaurants offering video´s, cheap drinks and even cheaper food. The more up-market restaurants are ensconced in Kuta´s small narrow (gangs) alleyways. The internationally famous Poppies and a string of other hidden garden paradises offer the weary tourist a welcome respite from the haggling streets. Cold beers, exotic cocktails, delicious food, all will be sold at a fraction of the Western prices. If action is what is wanted, then Kuta is the place to be. Heading North along the main street of Kuta (Legian Street) is Seminyak, the slightly more up market area of Kuta, housing the quaint local hangouts of some of the foreign Bali residents. Italian, Indian, Greek, French and many more are just an example of not only the food on offer but also of the cosmopolitan that Seminyak has become. Fashion boutiques, interior designers, candle makers, painters and many more are the chosen careers of these eclectic nomads. The most famous landmarks here are KuDeTa, Red Carpet, Metis, Sarong and Sardine, all restaurants that usually start buzzing at about 10pm. : Café Luna, Café del Mar, The A-Bar & Liquid are the human watering holes all located on Jl.Dhyanan Puta that really come alive after midnight. This roadside town produces a large part of Bali´s ceramics, statues and temple accessories. The Sadat Temple in the town center has interesting wall carvings. Originally built in the 17th century, this royal family garden temple was extensively renovated in the early 1900´s. Surrounded by a moat and lotus lake, the temple´s inner courtyard has an impressive number of Merus - tiered shrines built for the Bali´s ancestors and heroes. These locations can be found near the village of Sangeh, just North of Mengwi. A group of monkeys guards the impressive 17th century temple, which is set in the heart of a nutmeg forest. Beware of the monkeys as they have a reputation for being swift of hand and light of foot. Hold onto your cameras and bags tightly, it is best if you don´t wear jewellery. Canggu, an extension of Kuta Beach development as a beach resort, offers a perfect escape from the tourist crowd. Many private villas or Balinese style cottages built with a blend view of rice terrace and ocean. 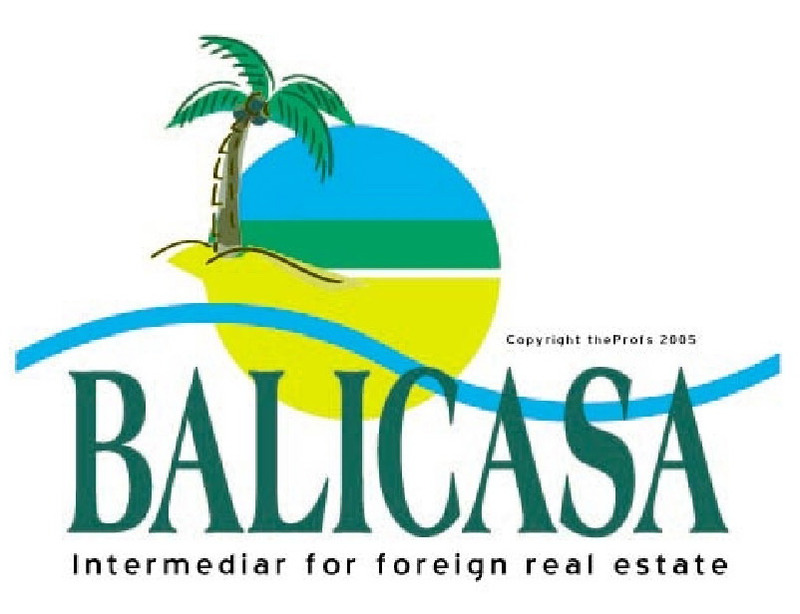 Most of the villas are built and own by expatriates but many of them available for short or long term lease. Canggu is the new hot spot. Recent development can be found here and all kind of trendy restaurants can be found here. Seminyak is moving into the direction of Canggu, making this then next place to be. Important to mention are the perfect waves in Echobeach. Here you will find the surfers most of the time on the water, waiting for the best wave to catch. Serangan Island, a 73 hectare island located just 250 meters off the southeast coast of Bali, is the resident of the Sakenan temple - one of the most visited temples for religious purpose on the Southern part. Serangan island is also known as turtle island. According to the legend, Sakenen temple was founded in the 10th century by wanderer-priest Mpu Kuturan. The island can be reached by boat either from Sanur, Suwung or Tanjung Benoa. Since a road has been built as part of an exclusive resort project on the island, now it can be accessed by car, make a right turn in East of Benoa’s harbor intersection.